WASHINGTON – They kissed, chastely. They thrust their shoulders back for a 21-gun salute. And, yes, they shook hands – and even, at one point, held outstretched hands for a brief jaunt amid the columns. President Donald Trump's review of the troops to celebrate the arrival of French President Emmanuel Macron's arrival at the White House Tuesday was keeping with tradition, though the president – a self-proclaimed law-and-order leader with a professed weakness for military parades – couldn't help but wear the Cheshire cat look of man who got to gaze upon his military might by simply stepping onto his back portico. Tuesday morning's breeziness on the White House South Lawn, however, belied tougher private discussions to come – on everything from the Iran nuclear deal to how to handle the aftermath of their recent joint strike in Syria. But for at least an hour, Trump was able to offer Macron a slimmed-down version of last July's Bastille Day parade in Paris – an event Trump enjoyed so much that he ordered up his own military procession this coming Veterans Day. After "Hail to the Chief," as well as both countries' national anthems, Trump and Macron stepped down off their podium to walk the line of the crisp troops – rarely directly facing them, but angling their heads slightly to take in the military tableau. Both Trump's wife, Melania, and Macron's wife, Brigitte, also attended the ceremony, as silent – if arresting – partners. 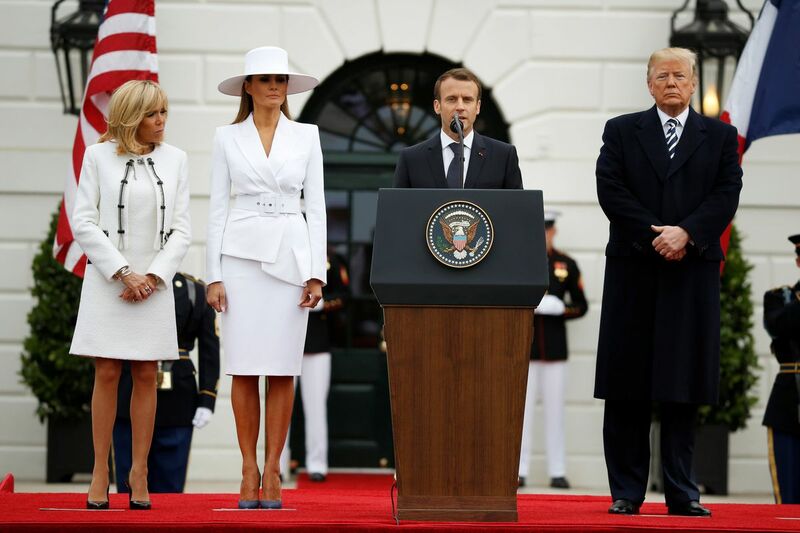 The first lady, in particular, cast a striking silhouette against the overcast sky – clad in a sleek, solidly white Michael Kors suit and white hat, which seemed to channel Olivia Pope, the heroine of ABC's political drama "Scandal." At one point, a marching band clad in revolutionary gear – black tri cornered hats and red blazers – glided across the lawn, woodwinds in the front and percussion in the rear. Though both leaders addressed the crowd, and one another, during the ceremony, the conversation turned tougher during a brief gathering after in the Oval Office, during which Trump was asked if he would be willing to stay in the Iran nuclear deal – something Macron is hoping to persuade him to do. "We'll see," Trump said, before calling it "a terrible deal," "insane" and "ridiculous." Still, in a possible olive branch, Trump declared, "It should never have been made. But we will be talking about it." In literature announcing the arrival ceremony, the White House – in perhaps either an effort to emphasize United States' long relationship with France or a bit of a historical blunder – proclaimed the proud U.S. tradition of a military arrival ceremony dates back to the 17th century – at least approximately 76 years before the United States became a country.